Certified Scrum Developer®(CSD) credential is a reflection of the holder’s technical assessment and grasp of Scrum principles. CSDs are in much demand for their specialized technical knowledge of Agile, and their commitment to continuous improvement. Our comprehensive course in CSD training helps you earn the Certified Scrum Developer credential that can demonstrate that you have a comprehensive understanding of Scrum principles, and have grasped Agile engineering skills. The training is in two parts. In the first part which is for two days, participants are taught the Scrum framework, principles, roles and ceremonies and how to work in the Scrum environment. Holders of the CSM credential can skip the first part and attend the 3 day CSD Technical Track training alone. The second part is the three day CSD Technical Track training that offers theory and practical sessions on actual design and code samples. This training will help you grasp concepts in a clear and practical way. As a CSD credential holder, you will have your own profile page on the Scrum Alliance website and can use a specially designed logo to highlight your credentials. In order to earn a CSD, we require at least five days of formal training taught by a Scrum Alliance Registered Education Provider (REP) and a Scrum Alliance Authorized Instructor. CSM holders can skip the first 2 days and undertake the 3 day Technical Training alone. A minimum of three days must be technical training through a three-day CSD technical skills course. At least one day must be dedicated to the study of Scrum through an introduction to Scrum or a CSM course (please refer our CSM training brochure for more details). Days 4 and 5 can be either completing a Certified Scrum Master certification OR attending a one-day Scrum elective course AND a one-day introduction to Scrum course. This 5 day course fulfils the minimum requirements for the CSD certification. You must also demonstrate an understanding of Agile engineering practices by passing a CSD assessment provided by the trainer. The trainer will upload and pay the certification fees for students as they take CSD-track courses. If you are a Scrum Alliance member and a CSM and take a 3-day CSD Technical Track course, you will receive notification to accept your CSD license, and the CSD certification will be added to your profile. There is no need for you to apply. Your certification is good for two years. If you are not yet a Scrum Alliance member at the time of the first CSD track course, then you will receive membership for one year. After you complete all CSD requirements, as listed above, you will receive CSD certification notification. Your certification is good for two years. You must make a lifelong commitment to continuous improvement by incorporating Scrum principles and practices into your world of work. Alex is a fantastic trainer. I did not have much expectation from the training but I have learned a lot in the training. Not only I got to know more about Scrum and its tools but also where to use it and where not to. Alex has immense knowledge in scrum having spent more than a decade as a Scrum Professional. I would recommend everyone to register for this course who wants to know about Scrum processes & practises. I took the 3 days Certified Scrum Developer course at Knowledge hut and overall I had an enriching experience. The class size was good with 25-30 folks in there. The course was well-organized and distributed across the 3 days. Before this training, I had kind of informal understanding about Scrum. However, post this training my knowledge about Scrum and Agile principles has formalized and has been given a better shape. I had a very good experience with my CSM training. The logistics were well-planned, and the quality of coaching was excellent. What’s the importance of a CSD Certification? Scrum is rapidly emerging as the desired approach to product development, and the Certified Scrum Developer (CSD) credential is given to those who have demonstrated through formal training and a technical assessment that they have a thorough grasp of Scrum principles. To succeed with Scrum, teams must have very specific skills and capabilities. They must be able to break down functionality into small blocks which fit into sprints, and develop high quality software that is flexible enough to be changed easily. No, there is no online/virtual course for CSD. The CSD Certification requires in-depth knowledge of the Scrum essentials and its technical concepts, which you get from our certified experts who lead the workshop. You will get 40 PDUs and 24 SEUs on completing the 5 day training toward your continuing education requirements with the Project Management Institute (PMI) for PMP and PMI-ACP certifications. Those who attend the 3 day Technical Track training will get 24 PDUs and 24 SEUs. No, your certification fee is included in the workshop fee. How will the course benefit me? 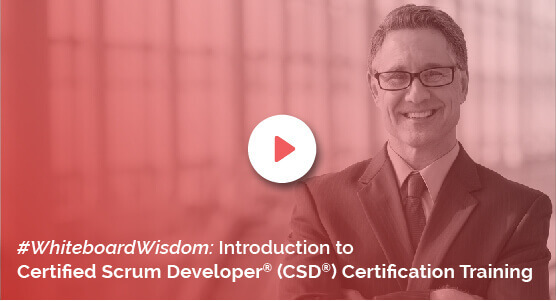 Our comprehensive course in CSD training helps you earn the Certified Scrum Developer® credential from Scrum Alliance that can give you an edge over others. The theory sessions offer actual design and code samples while the hands-on sessions and exercises will help you grasp the knowledge in a clear and practical way. Moreover, as a CSD credential holder, you will have your own profile page on the Scrum Alliance website and can use a specially designed logo to highlight your credentials. How do I earn a CSD credential? • A minimum of three days must be technical training through a three-day CSD technical skills course. • At least one day must be dedicated to the study of Scrum through an introduction to Scrum or a CSM course (please refer our CSM training brochure for more details). • Days 4 and 5 can be either completing a Certified ScrumMaster certification OR attending a one-day Scrum elective course AND a one-day introduction to Scrum course. You must also demonstrate an understanding of Agile engineering practices by passing a CSD assessment/evaluation provided by the REP/trainer. The REP/trainer will upload and pay the certification fees for students as they take CSD-track course. If you are a Scrum Alliance member and a CSM and take a three-day CSD-track Technical Course, then you will receive notification to accept your CSD license, and the CSD certification will be added to your profile. There is no need for you to apply. Your certification is good for two years. I am a CSM holder. Can I just take the 3 day Technical Track training to become a CSD? Yes. If you are certified CSM, you can attend the three-day CSD-track Technical Course to achieve your CSD Certification. Once you complete the training, you will receive a notification to accept your CSD license, and the CSD certification will be added to your profile. The CSD certification is valid for 2 years. Hamburg, the second largest city in Germany, has risen like a phoenix through its many catastrophes and an impressive multidimensional economy providing great career opportunities for everyone. In this rapidly growing city, enrol yourself into the CSD training in Hamburg by KnowledgeHut to give yourself an insight to faster growth and improved skill sets. A CSD certification in Hamburg brought to you by an institute as reputed as KnowledgeHut will enable you to get hold of the best materials and trainers in its innovative online classroom training and practice sessions. This 5-day rigorous workshop of Certified Scrum Developer training in Hamburg will help you cover all the aspects of CSD, starting from the basics to advanced integration. On the first day of coaching, you will have detailed introductory sessions concerning all the initial topics of the course. The second, third and fourth day will take you through elective discussions and the technical track of the course that will be imparted through e-learning and classroom learning in the academy. The final day will include demos and exercises by the tutor, followed by a recap of the course of CSD training in Hamburg. In addition to being highly cost-effective, this CSD course in Hamburg will give you extensively detailed e-book materials and lectures. The personal experience gained in this course will be unparalleled. Register yourself for KnowledgeHut’s Certified Scrum Developer certification in Hamburg and get the best worth for the money you pay, that is inclusive of the Scrum Alliance Certification Examination fee. You will also get to be part of a path-breaking learning process that will prepare you in the best possible way.